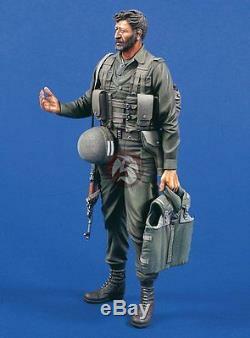 Verlinden Productions 120mm (1/16 scale) Israeli IDF Captain from Golani Brigade in 1985 530. This is a resin figure kit from Verlinden Productions. Kit consists of unassembled and unpainted resin parts. Built and painted one's picture is for reference only and put for you to enjoy fine detailing of Mr. This item is unassembled and unpainted. All extra model kit(s) and figure(s) in the pictures are for illustrative purposes only, and they are not included. Verlinden Productions is the epitome of aftermarket military kits and resin figures which brought thousands of military miniatures and related products to the market. The company is the brainchild of Belgian modeler Francois Verlinden, a Belgium-born entrepreneur, author of many books, photographer and military miniature artist who founded Verlinden Productions in the early 1980s. Verlinden Productions is the granddaddy of the aftermarket parts and resin figure manufacturers. Verlinden has influenced legions of modelers, and will forever be one of the most significant figures in 1/35 scale modeling. Verlinden's outstanding eye for detail and superior quality puts him in the top echelon of his craft. The resin quality is considered as one of the best in the world. The item "Verlinden 120mm (1/16) Israeli IDF Captain from Golani Brigade 1985 Resin 530" is in sale since Sunday, December 30, 2012. This item is in the category "Toys & Hobbies\Models & Kits\Military\Soldiers, Figures". The seller is "dragon-hobby" and is located in Sterling, Virginia. This item can be shipped worldwide.